Most marketing & branding agencies want to say they “do it all”. The reason behind it? The digital landscape is changing. For the innovative and engaging 360 campaigns of 2018, a simple landing page and an email campaign are not enough. Even in addition to all the posters, billboards, TV ads, and, hell, even social media. It is just not enough. Modern-day clients know it. They want to stand out and engage their audience across multiple channels including web, mobile and sometimes even Augmented or Mixed Reality. Agencies say they do it all as they do not want to lose business. Or recognition. Or awards they can receive by delivering creative, 360 solutions. Moreover, they do not want to become obsolete in an evolving environment. That is understandable. But let’s be real: no one can do everything. We all have special skills and talents that we should focus on instead of trying to constantly overcome our weaknesses. Now, I am not trying to say that we should not work on ourselves and try to become better. I am simply stating — following Gary Vaynerchuk’sarticle — that sometimes focusing on your strengths is far better than dwelling on what you cannot do. I genuinely believe it is true and a key to success both in a professional and personal environment. What I would like to show you is that with a right partner you can focus on your strengths and outsource other tasks without losing business. More than that, you can expand your service line and utilize your talents on new platforms that you did not have an access to. Having an expanded offering will give you an access to the opportunities you would not approach otherwise. This is not a recipe for short-term gains. What we are shooting for is a way of building new relationships and growing your business beyond your current reach. You have an opportunity (it can be either a new lead or an existing client) that wants to work on a big, scary product that they have an idea and a plan for. Or, maybe, it is somebody recommending you to take a part in a bidding for a large campaign consisting not only of copywriting, creatives, and media buying, but also developing dedicated web and mobile applications. Things in common? The scope is vast. It requires your expertise. And one more thing — it requires technical skills, too. Have no in-house technical team. Have a few software developers in-house. They are either loaded with work, or they use a technology that is different from the one you specialized in. You need to keep your staff highly utilized and this project cannot wait. 1. Pass on the opportunity. The easiest way to deal with it. You stay in your comfort zone, the opportunity is “not for you”. I will not want to change your mind but let’s just imagine if there is a different way that we can proceed. 2. You decide to grow your technical team and do the entire project in-house. What Should You Expect from a Software House? A software house should understand that sometimes you do not want them to brag about the collaboration. That kind of white-label work model is fully understandable. Data and information can be more important than money these days. The software house of your choosing should keep all proprietary information in the strictest confidence. You should feel as having your own technical branch. You should receive the support of a dedicated project manager — one that will be responsible for completing the project within the agreed upon timeframe. You should gain the comfort of constant communication. She or he would keep you up to date on all developments through regular reports. If the need presents itself, you should also count on technical consultations with the technical team members in whatever form you wish. Sometimes, technical people or project managers could be expected to attend a meeting or a video conference call with you acting as your agency’s employees. That means they would have the ability to ask your client the right questions directly so that your team does not need to act as a forwarding machine and waste your time. Once the software house evaluates your technical needs, they should recommend the most practical solutions available. It is not only about choosing the best possible technology — it is about going with the best possible technology that suits your business and budget. You should be certain that you will get fair estimates and still turn a profit. Payment schedule should be adjusted to the project you are running together — so the initial investment on your side is reduced. Stability, security, and responsibility when it comes to the technology. You will not get that using a template or looking for the cheapest solutions on the market. You will get that with a team that provides you with 100% attention to details and dedication towards your goals. What does a software house get in return? Your satisfaction, ability to grow with you, a project that allows us to work on the things we love, and possible word of mouth references. Sounds like the Right Way, but You Are Still Scared? I Get That! I understand it. Trusting somebody with your clients and their satisfaction is terrifying. I had the same struggle once we started to scale and we had to hire new people to join the core team. However, staying in your (and your business’) comfort zone is a straight path to stagnation and becoming the dinosaurs of a modern era. How to mitigate the risk? Do not start working on the biggest project, with the technologies you do not know, for your largest client as a first time outsource engagement. You do not know what your software house can deliver. Do not expect this train of thought to result in successful delivery — you would have to be extremely lucky (or extremely experienced) to hit it right for the first time. I will be boring now, but I believe in a no shortcuts policy. Most of the things in life require lots of hard work. The process of finding the perfect software house and establishing the rules of the cooperation is no different. Step 1 – Choose the smallest tasks possible. Can you see them through in-house? It can be either a small internal project or an external one. The crucial aspect to take notice of is that it cannot be a task with an upcoming deadline. That way — just in case things go wrong — you will be able to accomplish it on time. Now, if you do not want to do this in-house, you can ask your friends, your friend’s friends, or even contact freelancers on UpWork. However, if you feel — or know — that you will have more such tasks in coming weeks, you might already consider testing out a variety of software houses. Assign them a couple of small projects. See how they perform while juggling multiple responsibilities. See if your project manager can keep up with the updates. Moreover, you can do that with several software houses at the same time. You will burn through some of the resources, but will save much more in the long run. Step 2 – Choose your preferred solution. Will it be the software house? Both the freelancers and your friend’s friends seem well enough. They do cool, wonderful things, and they all seem to care. But what happens when you feel will come with yet another project that needs to be accomplished at the same time? Will your freelancer have the capacity to deliver on the deadline? Will he outsource a part of his work to an entity you do not know nor are aware of? Or will he just fail despite the best efforts? At this stage, it is much safer to go with a software house that has experience working for global brands. More often than not, the right partner will cost around the same as top UpWork freelancers. The price might be a bit steeper — it will not be mind-boggling, though. The advantages far outweigh the risks here. How to proceed? How to choose the software house that will become your technical partner? Now, run the small project you’ve picked at point one. Overcommunicate with the software agency. Ask too many questions. Make sure all of them are answered. Brace yourself: most of the companies, unfortunately, will not provide you with the quality work that you and your brand are all about. For some of the entities out there, software development outsourcing is just a way of making a quick buck. They do not invest in their brand themselves, so how could you expect them to invest in yours? But worry not. You did just run a small project with no looming deadline. In case the software house fails to deliver proper results, the consequences will not be severe. The next step is to assess what went wrong and either try again with the same firm or choose a different agency. I know you’ve also conducted a technical interview and asked the agency about quality assurance. The project seems to work as intended, and it’s even fast. However, how could you know if the code underneath is of good quality and will scale if needed? You can use your in-house technical staff to do a code review of the first two projects to make sure the software house is utilizing a good architecture, proper design patterns, and conventions. It will take some of your team’s time, but still less (especially long-term) than doing the entire project internally. If you have no technical team at all, you could use a trusted external contractor to review the code pushed by the software house. Code review like that will allow you to make sure that the project looks good not only from the outside, but is also created on solid architecture and will serve its needs for a long time and scale if needed. If everything goes right this time, proceed to a Step 4. If not, rinse and repeat. Step 4 – Engage with slightly bigger engagements, but do not commit yet! Do not be tempted to directly jump into the deep waters. Take it slowly, step by step. An agency might to its best to deliver perfect results with the pilot project, and then fail with the second one. It is a simple mindset: we landed a client. Now, we can rest. This is a losing attitude, and not only in business. You do not stop working on your relationship after the first month with your girlfriend or boyfriend, do you? Increase the scope of work with each project. Your relationship with the extended team grows, you create a bond between each other, the communication is easier. You take on bigger and bigger challenges each month. Step 5 – Re-sell. Iterate, increase your company’s knowledge and technical capacity, add new areas to your service line. Stay relevant! Chances are, you might have expected some magic at this point. There is none. You need to continue repeating the previous step. Sometime between a month and a year depending on the scope of work, you will begin to notice that technical knowledge in your team is constantly rising. Your people feel more confident in regard to tech-based projects. At this point, you fell that you and your technical partners can conquer the world together. We are a software house. You guessed it. At In’saneLab, we know what we are exceptional at what we do. We are great at designing and developing applications for modern platforms – web, mobile and mixed reality. We are in the same situation though. More and more projects require complex, 360 degrees attention. We do not want to pretend that we can do media buying for our clients just to get additional business. Sure, we could do it, but not at the same level of quality that firms who specialize in these types of campaigns. Their ability to truly comprehend project needs and high-quality outputs from the start has contributed to the collaboration’s ongoing success. In’saneLab’s attentive and detail-oriented team works to deliver up to client expectations, setting them apart from other software houses. As a company, we want to grow. However, we want to grow within our field of expertise. Our mission is to become a go-to software agency that is focused on quality of the work and customer support. We are not competing with marketing agencies. We would rather focus on software development and be an extension of their expertise. Every day, we are helping marketing firms with global reach to help them successfully bring the Digital Transformation to their clients. Most of the time, we do so quietly. Nobody knows we are there. 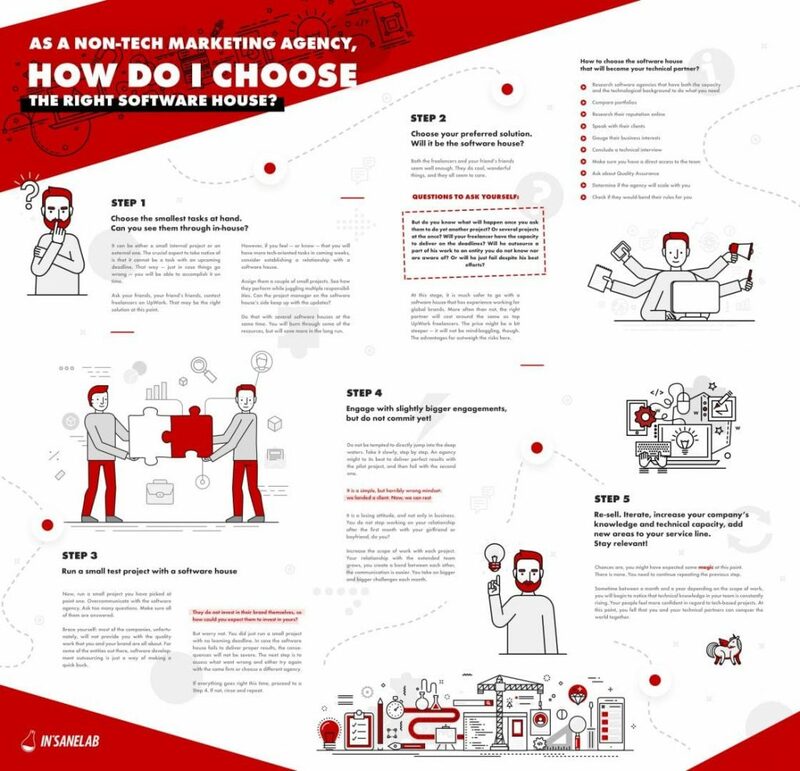 If done right, it is a win-win relationship model for both the marketing and the software agency. But do not listen to me. Listen to the ones who actually brag about our cooperation. “Our cooperation with In’saneLab has been going on for four years now”, says Tomasz Pilch, a Co-Founder and Creative Director at BLURBSTUDIO. “During that time, we managed to finish absorbing, original projects together. To us, In’sane is not simply an agency, but a reliable technological partner. They don’t only do what they should, but also consult and advise us on many different levels. The capabilities of the team at In’sane go way beyond what’s expected of them. They don’t only do what they should, but also consult and advise us on many different levels. Another thing – they do not only excel when it comes to the technical stuff, but they also know a lot about the design. It’s a well-functioning mixture of programmers and designers, and they can deliver within each of the fields in an equally satisfying way. In’saneLab remained professional throughout the time we worked together. They adapted to our needs and provided us with the necessary information and solutions in areas that we do not specialize in”, Tomasz adds. Do You Need Technology Support? Looking for an experienced team extension and software consultancy? Want to scale?